I remember my first “newly separated” holidays. I had a young son and felt sad and alone facing the holidays knowing the “we” traditions were a thing of the past. Add to that my new one income household and I just wanted the new year to come and skip the holidays. But, I also wanted to make the holidays special for my son. I was feeling guilty for the breakup of my family. But looking back at that first holiday 10 years ago, I know that we built new traditions and my son survived and continues to thrive. We didn’t have lots of presents, like Christmases before, but I have such special memories of setting up blankets, having a fire, making smores and watching the Polar Express and The Grinch with my sweet boy on Christmas Eve. These many years later, with a teenager on my hands… we still do that and you just can’t put a price on that! Take some time to really determine who you want to honor this holiday. 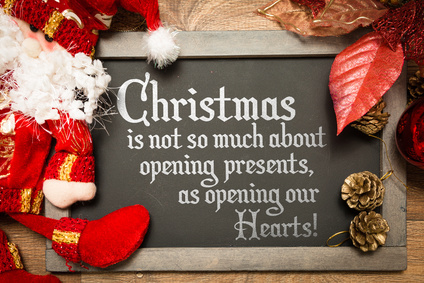 If your custom is to give gifts to all your family members, try just doing presents for the kids, or do a “Secret Santa” so that everyone just has to buy one gift. I know it sounds goofy, but true gifts really do come from the heart and take many forms other than brightly wrapped packages. Even a beautiful card with a heartfelt note can mean the world to someone you care about. If they are old enough, be honest with them. Let them know things will be tight. Ask them what they really want this holiday – you might be surprised what they tell you. Those big-ticket items may have to wait until next year. What to do instead? When my son was young, the Dollar Store was my best friend. You can find decks of cards, coloring books and supplies, board games even great decorations. Make stockings and gift baskets and fill them will lots of fun activities. Create an advent or “countdown” calendar to open each day. Include a small surprise each day so your kids can feel the holiday spirit each and every day. This is great not just for your children, but for friends, neighbors and family. Make “gift certificates” for yard work, car washes, babysitting. Take the time to help an older neighbor or family member organize their photographs or pantry. Helping others has proven to be one of the best ways to turn your attitude around. It takes your mind off your troubles and sets such a wonderful example of helping others for your children. Donate your time and talents at the local domestic violence shelter, food bank or SPCA. And not just at the holidays – try choosing a different charity or nonprofit and volunteer one day a month with your children – then at the holidays, reflect back and share those experiences. You may have always been the person who decorated for the holidays and like things a certain way… but step back, allow your children to add their “expertise” to the decorating. We like to make handmade ornaments for our tree and to give to friends and they make great teacher gifts too. If you keep a positive and upbeat attitude I guarantee it will be contagious and “infect” your whole family. I know from my experience, that the holidays can be tough when you’re going through separation and divorce, but it also gets better.